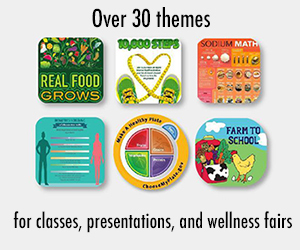 WHAT: Making attractive plate presentations for healthy food, which is a challenge because you are often working with brown whole grains and you are using less meat and less fat. The good news is that you can really increase the color with fruits and vegetables. 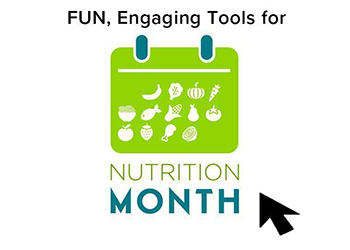 WHO: The intended audience is for professionals who teach cooking demos, food service managers, dietary managers, dietitians, home economists, teachers and even aspiring culinarians. But anyone who wants to make a better looking dish in their kitchen would benefit, too. We use simple tips that make the food look and taste great - it is "edible food styling" - no weird chemicals or funny tricks. WHY: So everyone can enjoy making a really beautiful salad. My plating skills are honed from over 20 years in the foodservice industry including 2 Hyatt Hotels, many food shows, photography shoots, plus my CIA and Switzerland culinary education. An aesthetically-pleasing presentation is always necessary in all facets of foodservice. Presentation skills carried me through the rigorous tests of ProChef II, where I really learned the concept of the useful versus frivolous garnishes. These are plated salad presentations that people will love! My favorite chef, Hans Hickel, said, "People eat with their eyes!" HOW: Study and practice our tips below and bookmark, take one our courses, or subscribe as a premium member for access to our recipe library and newsletters. 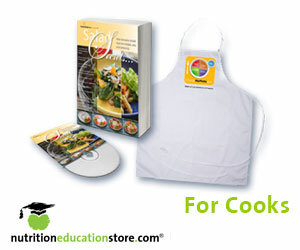 If you want to make your presentations better, you can practice every day as you cook. There are countless cookbooks, blogs, magazines, and Instagram channels to give you ideas, too. If it looks good to you, try it! Rely on ingredients that do NOT go with the food you are serving - examples include: a strawberry with a stem, a cutesy carved flower radish, big sprig of parsley, too-thick tomato slice or big piece of lettuce. Usually these add color but are not eaten. These are the easy way out. They are often an afterthought. BETTER IDEAS: chopped herbs, sprinkles of spices, drizzled sauces, dots of flavored oil, vegetable puree, thinly sliced fruits or vegetables that get eaten and add a crisp texture. Serve a plate full of bland-colored food. BETTER IDEAS: shredded colorful veggies like carrots, red peppers, tomatoes, beets, etc. 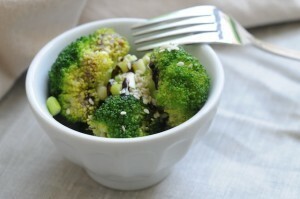 Try to mix up the colors so that you have an even spread of color on the plate. As Master Chef Rudy Specklcamp said to me on my final ProChef II test day, "The craft of a chef is to make food that looks and tastes delicious." He was talking about slicing everything neatly, choosing the right garnishes and finding accompaniments that make sense. This part is hard - it makes you think! Keep it simple and fresh. Cut in a uniform manner whenever possible - diced items should be square. Use lots of white plates - food always looks better on white. Solid plates are better than patterns. The food should be the pattern and focus. When using colors, consider complimentary colors and a variety of color. TEST: Does the food really say, "eat me!"? Here are 12 ways to present a delicious, healthy salad. Try them all! 1) Tall - when making a salad, think tall. Tall could mean piling leafy greens in a high, airy pile. It can also mean a ramekin or bowl that is taller than it is wide. 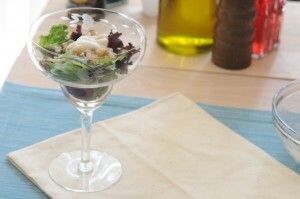 It can also include putting a wonderful Apple Waldorf Salad in a tall glass. Tall is tall! 2) WIDE - With salads, using a big plate helps them spread out wide so you get a lot of "goodies" on the top. This can be good for a platter that you are serving at a party - and also for a fun presentation, too. In this particular arrangement for our Spring Salad, we chose a large square platter and topped our salad with fruits and toasted nuts. 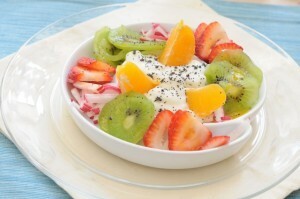 3) Patterns - in this Fruit Yogurt Salad, we have used a spiral pattern. But you can also line things up diagonally, horizontally or even in a scattered fashion. 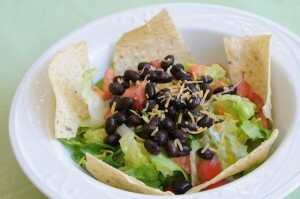 4) Framed - it is good to frame your salad with chips, lettuce, tomatoes, etc. In this Taco Crunch Salad, just 5 chips (less than half of a serving) make the taco salad more appetizing and provide a contrasting crunch and toasted corn flavor. 5) Fans - if you fan veggies over the top you get an interesting look as we did with this Asian Slaw. 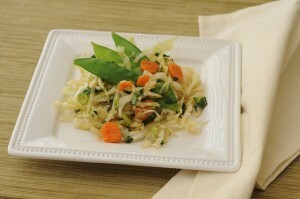 We used snow peas but you could fan thinly sliced veggies like carrots or bell peppers, too. 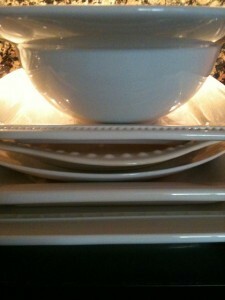 This pile of dishes is on my microwave, ready to go! A great source for china is the sale aisle in a department store or home store. Discontinued items are always on sale and they are often interesting for plate presentations. I always scan big stores like Macy's during the holidays. 7) Cascade - this Pasta Shrimp Salad, made with whole wheat penne, cascades off the greens - the greens are shredded finely. 8) Citrus - I believe that a small wedge of lemon, lime or an orange that is squeezed over a salad adds a lot of flavor without adding sodium and fat. 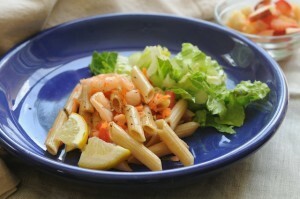 See the salad above - the tiny squeezable bits of lemon are meant to go with the Shrimp Pasta Salad. 9) Drizzle - this technique is used over and over in cooking and desserts - you drizzle the sauce over the top in a fine stream as we have done with the balsamic vinegar glaze over this Spinach Walnut Salad. Balsamic vinegar glazes are growing in popularity and available in almost any grocery store. You can also drizzle any dressing. 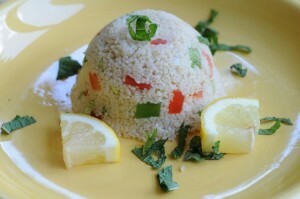 10) Molds - this is always fun with couscous in our Lemon Couscous Salad - you mold it in a scoop or bowl and invert it onto the plate. Molding adds a precise shape and it looks more enticing to eat a carefully molded grain versus spilling it all over the plate. This method would also work with tabouleh, quinoa, or rice. 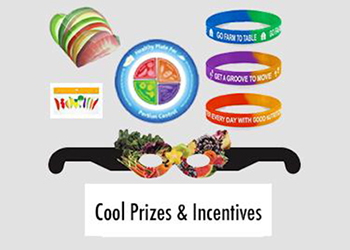 11) Color - fruits and vegetables add the most wonderful colors so use lots of them to balance color and flavor. 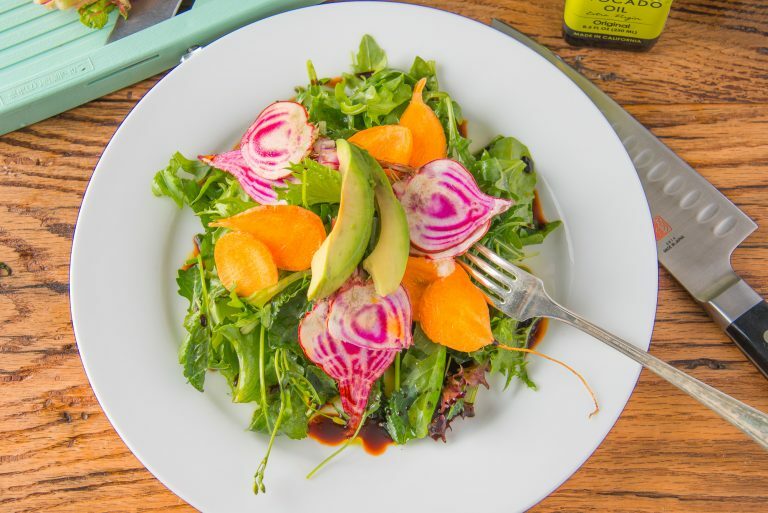 Consider using a Japanese mandolin to finely shave the vegetables so they are more palatable, like we did with the carrots and candy cane beets in this fresh salad. Check out the image below to see the translucency of vegetables that are finely shaved on a Japanese mandolin and with a sharp French knife. 12) Spritz and shine - normally chefs add a brush of butter or a spray of oil to foods to make them shiny. 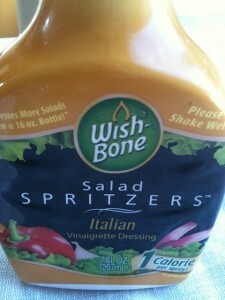 We like to use an Italian dressing spritzer. We are able to add a very light mist of a wonderful dressing - I bet we can dress a whole salad with less than a half teaspoon and it is shiny and fresh, never drowned! In addition to dressing there are delicious oils that come in spray cans. One of our favorites is avocado oil. 13) Tossed from a big clear bowl, with greens and herbs. 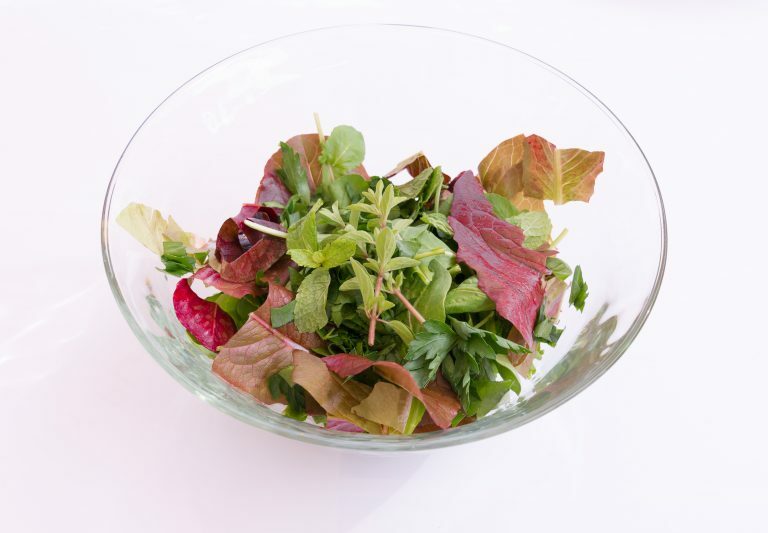 What better way to make a salad than to put a whole array of mesclun greens and fresh herbs together and toss them and serve them from a big clear bowl? This Mediterranean-inspired salad features a variety of fresh baby greens and herbs like mint, oregano, parsley, and thyme. 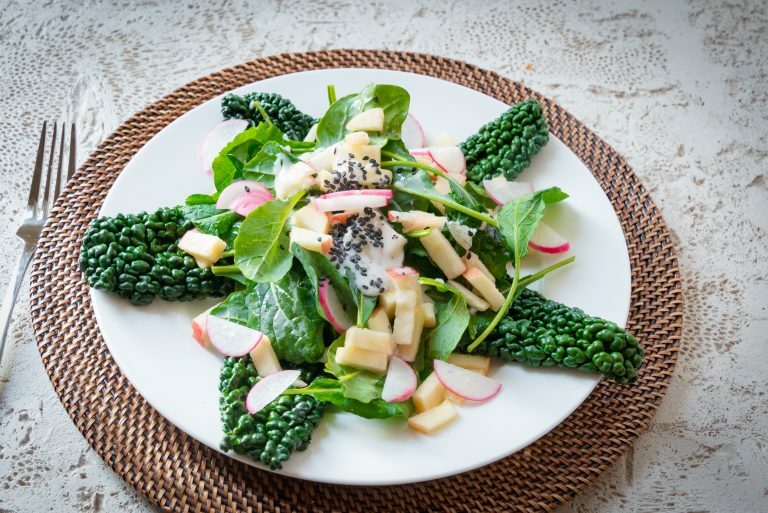 14) Like A Star - why not make a fun star shape for your salads? Look what we did with the Lacinato kale that was lightly steamed and set on the outside of the plate in a star shape! 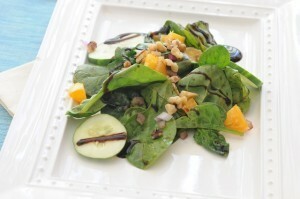 The delicious baby spinach and shredded apple with poppy dressing was set into the center. 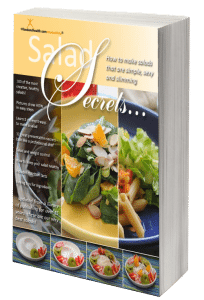 Many of these recipes are from the Salad Secrets Cookbook or our online database of recipes. 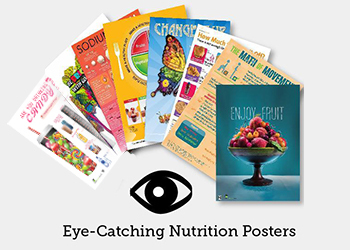 You will find delight in high-fiber, low-fat, low-sodium recipes that utilize a big variety of vegetables, greens, nuts, seeds, fruits, lean protein, fish and beans. 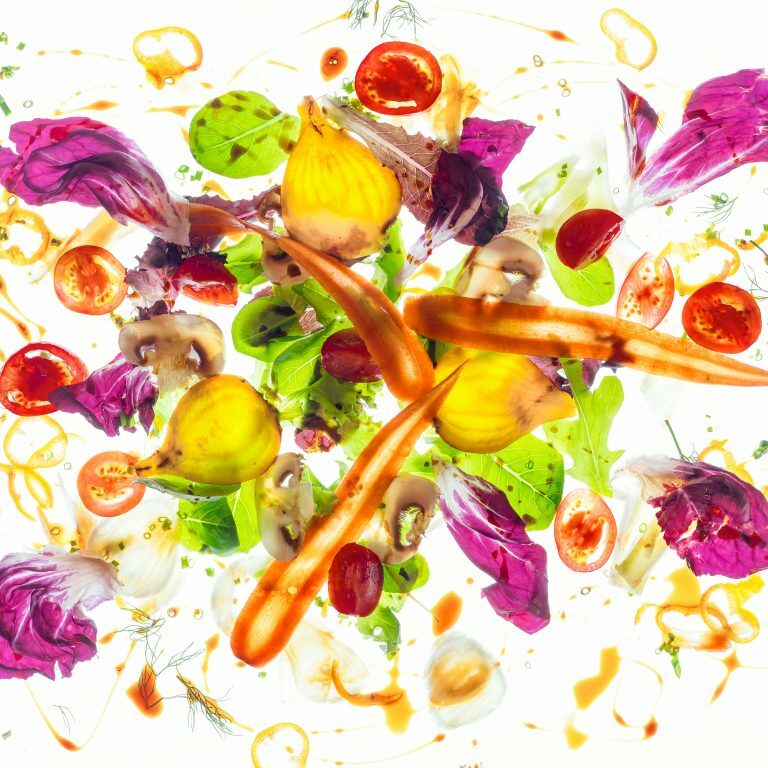 These are the most creative, healthful salads in the world. 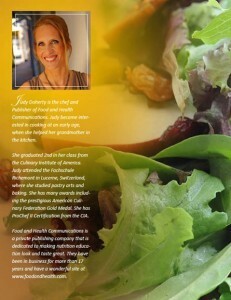 Get INSPIRED for healthy salad! 100 of the most creative, healthy salads! 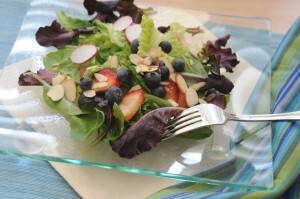 Salad and weight control - what does the research say?